25 January, Burns Night. Today is the 250th anniversary of the birth of Scotland's poet Robert Burns, and we're just about to sit down to our family Burns Supper. The neeps (yellow turnip) have been mashed, the tatties (potatoes) are nearly ready, and the haggis is (shock! horror!) about to have its 5 minutes in the microwave. Even more heretical, we're having vegetarian haggis. The children are probably haggised-out. Haggis will have been on the school lunch menu this week, and my son went to the school Burns Supper for senior pupils, resplendent in the young Scottish male's 'kilt casual' look: kilt with untucked and open necked striped or floral shirt. But I'm not showing you any of this. 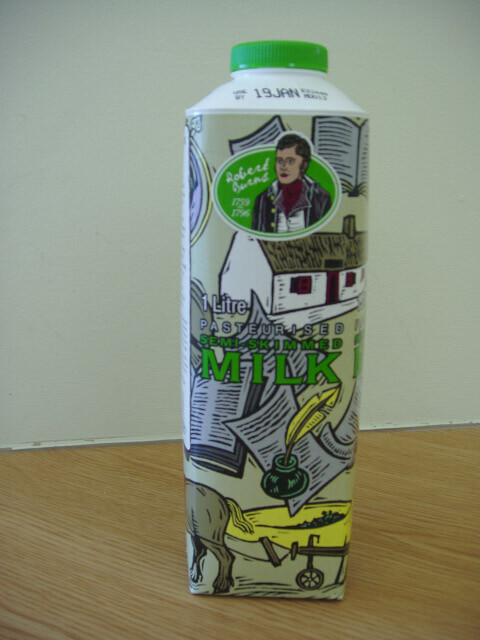 Instead, an example of the reach of Robert Burns into every area of Scottish life - the Robert Burns milk carton. The thatched cottage is his cottage in Alloway. The plough represents his harsh early life as the son of a tenant farmer. Enough history - I'm off for my haggis. I had veggie haggis too, so we can be heretical together! I have visited Scotland three times, the last in 1981 (obviously I'm over 21....)and loved it. The only Loch I remember by name is Loch Earn. My better half and I are fans of Monarch of the Glen and own all 7 seasons - we inflict it upon everyone we can. Everyone falls for the scenery. Your blog is great, I'll be back. Poetic milk sounds like a brilliant idea. I think we have had popstars or something in milk cartons, but it was nothing compared to this. What a good dinner , i like haggis ,neeps and tatties ... bon appétit! We hope that you enjoyed your dinner. What a unique way to portray Burns day by way of a milk carton. Excellent imagination in spreading the word. Isn't haggis something inside a calf stomach, or intestine? Does it really get cooked in the micro?? Karen, you're right. The original haggis is made of sheep's heart, liver and lungs mixed with spices, onion, suet and oats, and boiled inside the sheep's stomach. When I was growing up it was the only sort there was, and yes, we had it for school dinners. The vegetarian variety makes use of lentils, pearl barley, perhaps some soya, plus vegetables and spices. The casing is of course non-animal. The sort we buy can be cooked in the oven for 90 minutes, boiled in water for 45, or put in the microwave for 5 minutes. Next time you have haggis, would you take a picture of it first? Love your blog~ I am learning so much and I appreciate your conversational style of writing.. Wonderful!